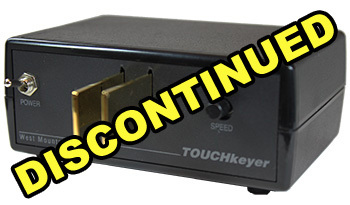 CW TOUCHkeyer has been discontinued. Just touch the paddles to send perfect CW. The TOUCHkeyer has no moving parts, no mechanical adjustments, no clicking sounds. With a little practice, you will find this easier to use than a mechanical keyer. The speed can be adjusted from 5 to 50 wpm. There's a built in sidetone for listening or practice, an output for your own speaker, and a direct paddle output too. The paddles are gold plated. They won't tarnish. It weighs 2lbs, heavy enough to keep the keyer from traveling during use. It can be programmed for 32 functions and has two 80 character memories for CW messages. (2) 1/8" Audio Cables, 6 ft.
(1) 1/4 to 1/8in. adapter.